Pink is a colour that every woman should have in her wardrobe. There are so many variations and shades of pink, there should be something for everyone. Fuchsia pink, also known as hot pink, is a lovely vibrant pink and is a colour that should be embraced. J.Lo was spotted wearing a gorgeous yellow neon dress, which was teamed with an eye catching pair of fuchsia pink heeled evening shoes. J.Lo certainly knows how to clash colours and look fantastic. Elegant fuchsia pink satin ladies shoes from the Lunar Elegance range, which is perfect for special occasions and weddings. Rouche detailing over the toe and a diamante encrusted brooch for that extra added sparkle. 8.5cm satin covered heel and padded insole for extra comfort. A matching handbag is also available, style code LUNV53 . The evening shoes and matching bag are also available in navy blue. Stunning fuchsia pink satin platform shoes by the designer Heavenly. An elegant peep toe shoe with a feature rose bud to the side of the shoe. 9.5cm satin covered heel & 1.5cm satin covered platform sole. A matching clutch bag is also available. Dazzling fuchsia pink pink satin sling back shoe by the designer Heavenly. An elegant closed toe shoe with a feature bow across the toes. Slingback ankle fastening for elongating your legs and a diamante encrusted buckle for that touch of sparkle. 6cm satin covered heel. A matching clutch bag is also available. Tulisa looked fantastic on a wicker sofa next to Tinie Tempah. I think you will all agree that Tulisa looked stunning in a hot pink dress and fuchsia sandals. Striking hot fuchsia pink evening sandals by the designer Heavenly Triple diamante encrusted straps running across the toes and up the foot and a diamante encrusted buckle for extra added sparkle. 4″ satin covered heel and cushioned insole for extra comfort. Available in a wide choice of colours. Choice of a bangle style or pain clutch bag to match. Stunning fuchsia pink satin and diamante strappy sandal by the designer Heavenly Triple diamante encrusted twisted straps running across the toes and a diamante encrusted buckle for extra added sparkle. 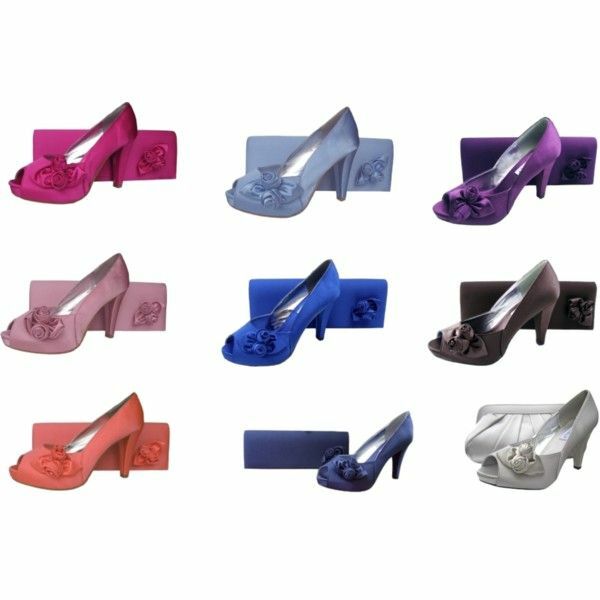 6cm satin covered heel and cushioned insole for extra comfort. Available in a wide choice of colours. Plain clutch bag available to match. So step on over to Sole Divas and view our stunning range of fuchsia pink evening shoes and ladies shoes.